University of the Arts London, the world’s 6th best university for design and art, specialises in delivering creative courses in art, design, fashion, communication and performing arts across six internationally recognised colleges. Brought all course management under a single, user-friendly hub. Across the six colleges, around 3,500 individual short courses were offered per year, totalling over 25,000 annual course bookings – however, these courses were managed using four completely separate systems and each college processed courses differently. This meant the University of the Arts was unable to fully undertake data analysis. Our training management system standardised all processes across all colleges, removed the university’s data duplication problem while ensuring resources could be efficiently deployed. Our steps in supporting the UAL ensures that they have total operational overview: Measurability, KPIs and true business intelligence through incisive reporting tools. As part improving the delegate experience, we’ve helped deliver highly targeted marketing communications and improved customer satisfaction. 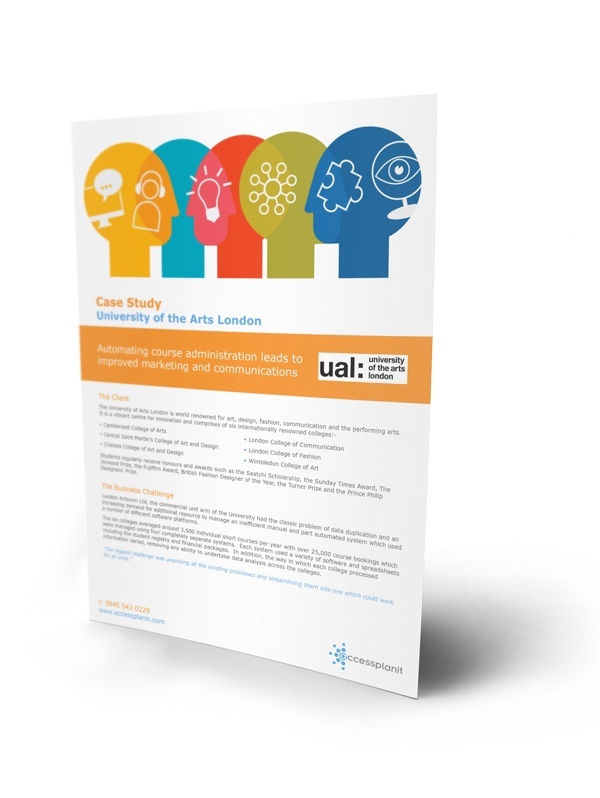 Get your free case study today, and explore how we cut time spent on admin by 50% for University of the Arts.